Horizontal Chamber Furance KNC/H - LAC Asia Ltd. The KNC/H chamber furnace with forced circulation is used for all types of heat treatment including tempering, artificial ageing, preheating, hot connecting, batch testing and drying. The furnace is designed for use under normal atmosphere where a very precise temperature distribution according to DIN 17052-1 and dynamic progress of the temperature curve are required. 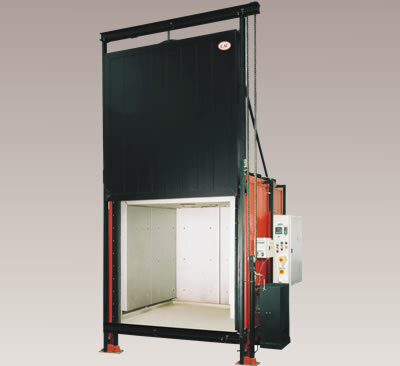 The KNC/H features a steel frame and jacket, a 500mm loading sill for horizontal loading and a hydraulic cylinder door opening system with safety terminal switch. The standard KNC/H interior metal muffle ensures dust free processing, making this furnace especially suitable for use in the glass industry. The standard design includes top insulating materials for high energy savings, an INDUSTRY programmable PID controller with real-time clock, HT40B limit unit, K thermocouple and a semiconductor non-contact switch relay. Chamber furnaces with forced circulation of internal atmosphere are used for all types of heat treatment (tempering, artificial aging, preheating, hot connecting, batch testing, drying, etc.) under normal atmosphere, where a very precise temperature distribution and dynamic progress of temperature curve are required. Horizontal circulation of the internal atmosphere ensures even temperature distribution in the internal furnace chamber, allowing the furnace to be set to meet DIN 17052-1. High-quality insulation materials result in low operating costs and dynamic progress of the thermal cycle. Shelves are supplied only in combination with the above-mentioned charging frame.